We are called to serve in the Order of Melchizedek. This is the order of the ascended Christ. He gives His instructions. We obey them, and somehow, if we are hearing and obeying correctly, we are Kingdom workers in a big, big picture. The previous generation were very hot on "checking things out". With leaders.Within the context of church life etc. etc. And you know what! That's great too, because when we start out we can have a lot of zeal but hardly any knowledge. But the role of leaders is not to maintain this role, and so prop up the longevity of their positions......but like parents, to develop an inbuilt confidence in disciples to be pretty sure when it's Jesus speaking. Frankly, the whole point of the 2nd level....or the young men stage has been dragged out for far too long. There's a whole churchlife generation dying in the wilderness, because the Person of Jesus was never communicated properly, only rules and instructions. Intercessors learn to move in the Order of Melchizedek. By following Jesus' revelation, they literally unlock the purposes of God on the Earth. Here are 2 examples. Lydia. : An Argentine dentist. Told by God to leave everything for a year and to come to Paris to pray. Around 1980. Told to treat it as a 9-5 commitment, just like a job. So she obeyed. And every day , between 9 and 5 she gave herself to prayer. We visited her during this time. And it was bizarre. She was identifying on such a deep level...she actually asked us whether she was saved!! She felt like an unsaved person. Yet she was breaking open the heavens in this little region of Paris, where a church was birthed. Nicholas and Pam have been staying with us this week. Originally called into ministry around 2000 to reach unreached people groups in Northern Russia, their ministry has been changing and developing as they have learned more, and as their confidence in Jesus has been growing. Tasks and operations which were taking years, are now contracting into months and weeks.They go ahead of the Cloud of Revival to help open up regions and areas in prayer. Their particular focus in recent times has been Latvia,Lithuania,Belarussia. This year it has been the northern territories....really north. Northern Norway , Finland and Iceland. They left today for a second trip to Iceland where they are to pray around its perimeter. On their last visit they were also present for 2 conferences. One with Josh Mills. Saw lots of gold on him!!. The other was John and Carol Arnott's visit to a new congregation...a sort of revival situation.Of street people. I am trying to report to you as many details as I can remember before I forget. But one thing sticks out from all these countries. Either the main worship leader, or the first key convert...be it in Latvia, Finland,Iceland...wherever...they were big in Vice. Trophies of grace. Organisers for the Devil, now dragging people into the Kingdom of God. Street people. No background in Church. Verily, the fulfilment of the scripture...where it says, if the sons of the Kingdom are not interested in my Party, my Bridal Celebrations, then go out into the highways and byways AND COMPEL THEM TO COME IN!!! So here's some bad or good news, depends whose side you are in. Just as the Jews fluffed it when Jesus came. So the Church worldwide are appearing to fluff it concerning the spreading of the gospel. If we will not obey scripture and go out and proclaim the gospel...Jesus is going direct to the street people anyway. Whether we like it or not. The deal in Iceland was like this! This Kingpin brothel owner, running his brothel in the flat next door, while having his hand in so many pies....casinos, clubs, many vice activities run by fear... sat up in his bed one night, turned to his wife and said..."Love, I don't know what's happening. I feel like I'm going to hell. I feel desperate. Please pray for me!!!" Within hours he has given his life to the Lord....and a congregation of 5 formed, which already is 200 strong. And it was to these John and Carol came.People remarked, how such a high profile leadership couple would bother getting down and dirty with them. No platforms. Just Church. Complete with going through a fire tunnel at the end as the final couple! How cool is that. Nicholas and Pam don't call it moving in the Order of Melchizedek. (I do)...but that is what it is.Having their agenda written for them on the fly as they go through these countries. Last weekend they were baptising converts in the posh spa hotel pool in was it Lithuania? ?I got a bit lost remembering what happened where. They found themselves preaching in one of the main mission churches in Finland. And something they do not like, advertised with a photo of them in the leading newspaper. 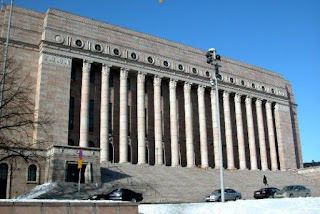 They found themselves in the Finnish parliament(Picture above) praying while a piece of key EU Legislation affecting the gospel on satellite was being discussed. You couldn't plan the strategy behind this stuff. It's the same way that Rory and Wendy Alec move also, by direct instruction, in setting up and managing God Channel. I thought some of this this would bless you as it did me. I'm thinking i'm going to have to come and at least visit this church of yours...every door in the UK to date has been closed...but I have a plane ticket. Even if that is all I have. I come with Jesus! Ursula there could be timing in all this. I'm thinking Chris...you could be right! I have such peace about the UK...where in the natural there should be no peace! No accomodation, no work...etc...but you know...when its right, its just right! I'd so love to meet Peter, I love Grahams teachings...they have been such a solid foundation for me! In fact, I'm in dire need of some soaking! I have so missed having prophetic mentors in my life this season...but...have learned to turn to the greatest mentor of all! On to the next season...I feel ever closer to going home. I'll put a note on your blog.